Berry thanks Hammond for her recent gift and response to the Mother's Day appeal. Berry reports that Inez Wooten is still away on her wedding trip, and that Berry "gave away" Hattie McDougald at her wedding. 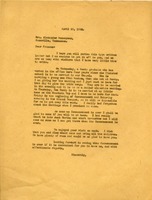 Berry appreciates Hammond's invitation to visit her at Mt. Kisco, but will not be able to get away. 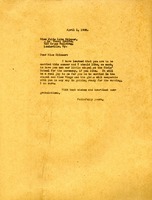 Berry wires instructions related to arrangements for Inez Wooten's wedding. 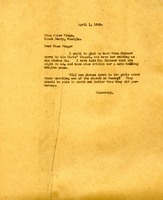 Martha Berry writes to say that she has approved the request of Julia Lake Skinner to have her wedding in the Girls Chapel. She also asks Wingo to see that the girls do a better job of marching out of church. 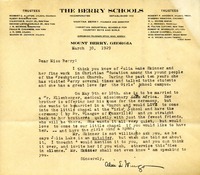 Wingo writes to Berry of Julia Lake Skinner's wish to be married in the Girls School chapel. 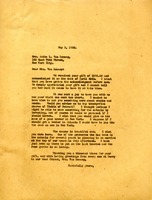 Martha Berry writes to offer the use of the "little chapel" for a wedding ceremony as well as aid in getting ready. 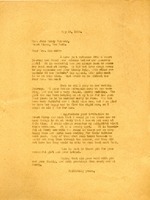 Martha writes to Mrs. Anthony to thank her for the gift that she sent to Berry. Martha Berry thanks Mrs. Van Lennep for the gift she sent to Berry and expresses her gratitude that she made a visit. 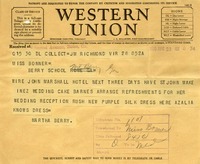 Miss Berry has invited Miss Neal to an event at Mohank Lake in August, and has sent Miss Neal a clipping about Marion Berry's wedding. Berry notes that Tom Berry, Virginia Campbell and the Bonnyman's attended and said it was the most wonderful wedding they ever attended. 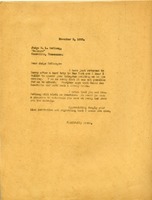 Berry regrets having missed a wedding, likely that of Judge McClung's daughter Ellen Lawson McClung to Berry's nephew Thomas H. Berry. 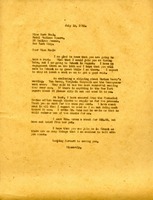 Berry writes to Ladd of the death of their friend Estelle Whitfield and encloses a clipping about the wedding of her niece Marian Berry to Prince Sigismondo Chigi. She reports that her sister, Princess Ruspoli (Eugenia/Jennie Berry) suggested that a $10,000 wedding gift would be appropriate. 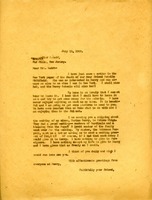 Martha Berry writes to her sister Frances of all of her upcoming commitments, including two weddings and Commencement. If it is convenient, she plans to visit Frances as soon after Commencement as she can. Rev. 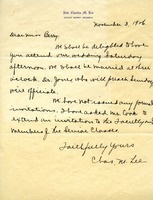 Charles M. Lee invites Martha Berry to his wedding. 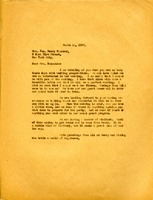 Adele Hammond writes from the R.W.S. Nova Scotia to thank Berry for the gift of a scarf and describes her wedding trip to the Caribbean. Adele adds an "O" to the monogram on her stationary to reflect her marriage to John Kensett Olyphant, Jr.
Berry writes of Alice Hammond's wedding, Emily Hammond's upcoming visit, and other visitors to the school.